Sometimes there are quilts that I'm happy with, and sometimes there are quilts I am thrilled with. This one sits happily in the latter category. Pebble Cascade's originates from a CJMQG challenge. Jessica Levitt (one of my dearest quilty friends) and Windham Fabrics provided those who signed up with fat eighths and scraps from Jess's newest fabric collection, Cascade. I've worked with these beautiful fabrics before, so I jumped at the chance (I'm not just saying they are beautiful... they really, really are. They remind me so much of spring and of parks and taking walks and being outside... can you tell I'm ready for spring?). I began by piecing together blocks of rectangle and square scraps by color, interspersed with gray and off-white (Free Spirit Egg Shell solid - it's soooo soft!). I thought if I started piecing blocks I'd figure out what to do with them eventually and I was right! QuiltCon inspired me to hack those blocks in half and start piecing in curves of bias strips. There is no applique here - just piecing. It was a pleasure to *not* worry about matching up the seams - I wanted the blocks to look a bit off-kilter (some are more so than others). Finally, I added pieces of Eggshell around each block until I had a quilt top. That part took forever and a day, but it was so pleasing to see the top come together over the course of a couple of weeks. It was a peaceful and reinvigorating process for someone who doesn't always revel in piecing. Free motion quilting is my favorite thing. For real. It took me a while to decide what to do... I mean, all that negative space was begging to be played with! Again, QuiltCon inspired me to create a centralized theme in my quilting and quilt pebble paths curving at random throughout. I discussed my process in depth right here. The pebbling was super relaxing - I made them all different shapes and sizes and marked some of the curves I wanted with my Hera marker. In the end, it didn't matter where the pebbles ended up because I just filled in the space with matchstick quilting (using my FMQ foot - so much faster than I would expect using a walking foot would be - tell me, is that right?). Up to the end, I kept adding lines to the matchstick quilting (which ended up not being "matchstick" really, but all different sizes apart and very organic/somewhat wavy). I am in love with the texture and I would definitely try this again on other quilts. So, I'm definitely not Leanne but I sure do love her style! I also enjoyed changing threads throughout - I used dark grey, light gray, cream, bright green, teal, light blue, and navy (each section of the quilt features at least three thread colors). At certain angles, you can see the sections of the quilt glow a little in green or blue (or maybe that's just me :D). So, here's my entry into the challenge. Here's a quilt where I stretched my piecing and quilting limits, and I'm quite smitten with the results. Luckily, this one will be traveling around with me as I visit some (somewhat) local guilds this spring! And just wait until you see the rest of the entries from my guild! Some of them are already on the #cascadefabricchallenge hashtag on Instagram, and @jtlevitt will be posting them soon. Just... wow. Seriously, go have a look! That is a beautiful quilt! Love the back. Really love this Jessica! Love when we start something not really knowing where it's going! I sincerely love what you have accomplished with this piece, its so fresh and original and so very skilled I think! Keep up this kind of work, you have a gift for it! Amazing quilt with al those details on the top and back. Your fmq makes it so interesting to lookat and I believe it is traight!!! I can understand why you are happy with this finish. It is a jewel! I love your quilt, it makes me think of looking through different windows and catching glimpses of the sky and tree branches. 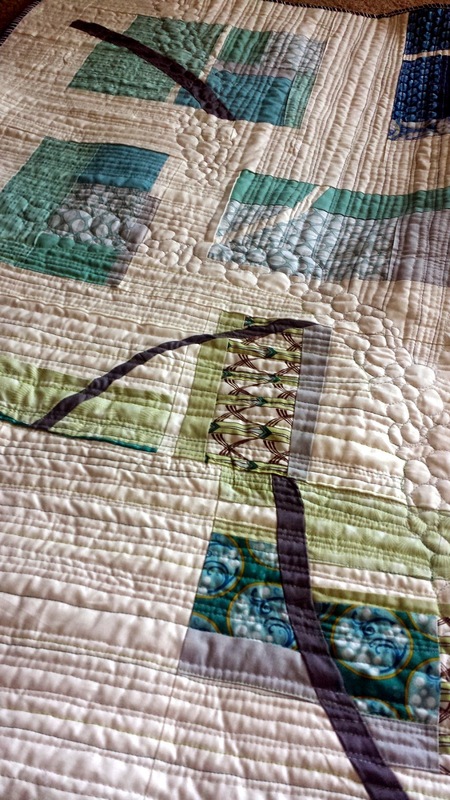 Using your FMQ foot would definitely have been faster than your walking foot, no need to turn the quilt around, and I love the organic matchstick quilting you did. Beautiful quilt! 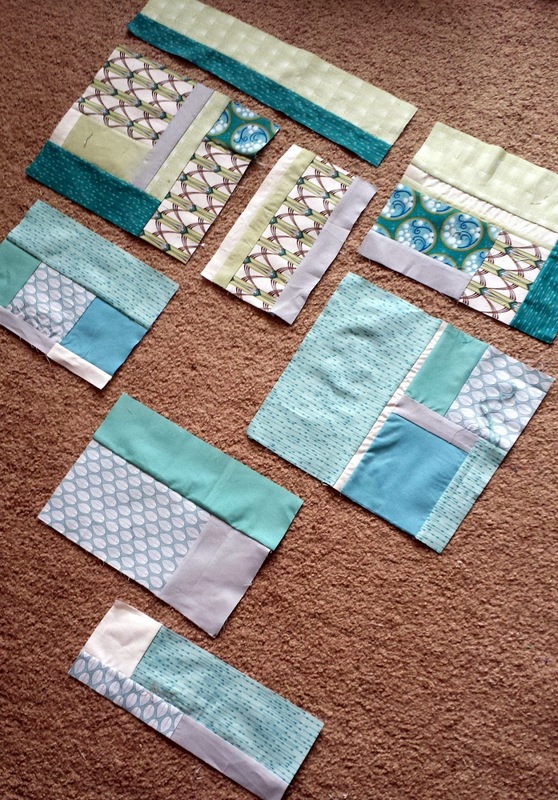 Love all the quilting you did too! You can't go wrong with matchstick and pebble quilting in my mind! Such talent! Sewing in all those curved pieces must have been hard! And the quilting is fantastic. Great finish. Thanks for sharing . It turned out so pretty! I totally agree that matchstick like quilting is faster with a FMQ--you don't have to rotate the quilt a zillion times! That makes a huge difference with larger quilts. Pebbles are not relaxing to me, maybe that's why I don't like them, they require a lot of planning, forethought, and focus. But the results are usually worth it, and the texture is hard to beat. 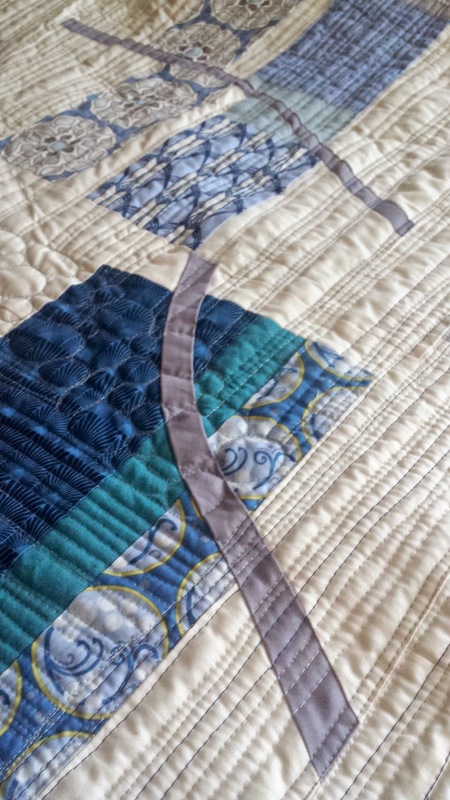 I love the way your quilting mimics the blocks with curves and straight lines, it really pulls the eyes around the quilt to see everything! That looks beautiful. I love the colors and the wonderful quilting. What a great quilt! The quilting adds so much. Beautiful job! I love this quilt! The piecing and the quilting go so well together! 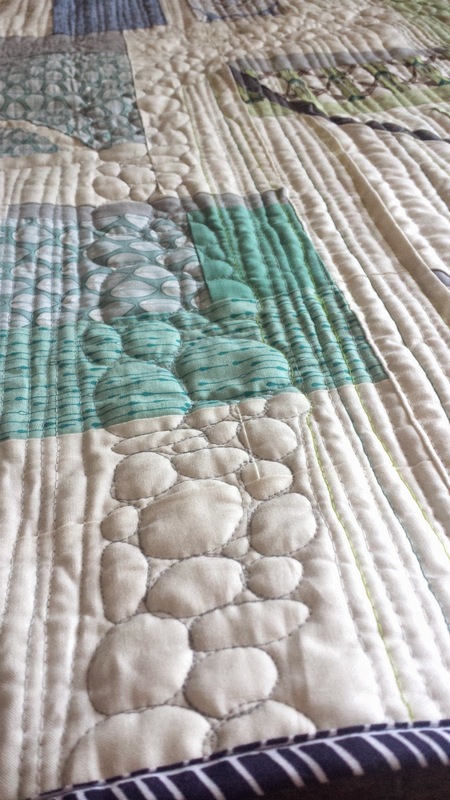 I love the straight quilting lines and pebbles, beautiful! Very nice! I love that fabric. I agree with you--spring, parks, walks, etc. Oooh, I love it too! Great colours and composition, and the combination of pebbles and matchstick is so striking, Jess. Very cool! This is really a beautiful piece! 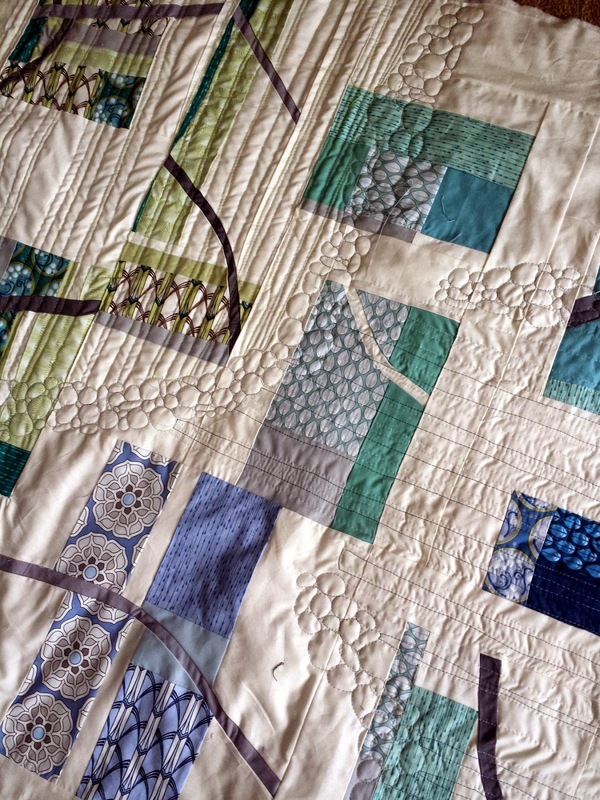 I like the way you have balanced curves and straight lines, and the quilting designs really enhance the quilt. You know, I love the bright quilts you do, but this one may be my favorite ever. I keep coming back to look it! It has such an organic flow to it and is just so peaceful. Looking good! Pretty color combo and interesting design. I think your quilting really just makes this quilt! It just gives the top so much more to look at and with your pebble quilting, I keep following all its lines to look at the next part of the quilt. That looks wonderful! Quilting is just great! I want to try something like that. Wow, wow, wow! Absolutely love the quilt and the quilting!